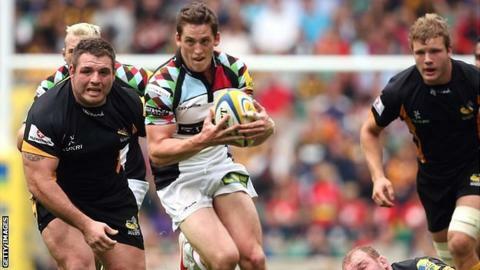 Champions Harlequins staged a stunning fightback to beat Wasps in their Premiership opener at Twickenham. Early tries from Christian Wade and Tom Varndell helped Wasps race into a 20-0 lead inside 12 minutes. Tom Williams got Quins on the board, but Wade's second try and scores from Marco Wentzel and Tim Payne put Wasps 40-13 up early in the second half. But Quins fought back with tries from Mike Brown (2), Tom Guest and Nick Evans, who then won it with a penalty. Kicking the winning points as Quins opened their defence of the Premiership title was a fine way for fly-half Evans to mark his 100th appearance. But it also meant disappointment for Wasps, who, with England flanker James Haskell back in the side after three years away, did so much to make it such an absorbing contest. It was hard to believe Wasps had only avoided relegation on the final day of last season as they dominated the early exchanges and turned their possession into points. Electric winger Wade, 21, got them under way by touching down in the corner to cap a fine passing move. Fly-half Nicky Robinson extended the lead with two penalties before Wade, part of England's summer tour party to South Africa, escaped down the right once again and then passed to Varndell, despite being over the line, to present his fellow winger with the simplest of scores. Williams raced clear to open Quins' account, Evans adding the extras, but Wade showed off his dazzling footwork to stand up opposite number George Lowe on his way to his second try as Wasps secured a 28-13 half-time lead. There was no let up after the break as Wentzel powered his way over from Varndell's fine inside pass before teeing up Payne to touch down from close range and seemingly put Wasps out of sight. But Quins had other ideas, especially after Guest charged down Robinson's kick and gathered the loose ball to score. Brown then scored twice in quick succession, the second after brilliantly catching Evans's cross-field kick on the run. When Evans fought his way through the Wasps defence to touch down and convert his own score, Quins were within a point. And, with two minutes left, Evans capped a remarkable turnaround when the dominant Quins scrum turned the screw and the former All Black landed his third penalty of the afternoon to give the champions victory in an epic encounter at Twickenham. "For 50 minutes we probably played as well as we have done since I have been at the club. "We talked at half-time about not switching off and keeping our concentration and how good a team Quins were and that they would keep playing. "Things that weren't sticking for them first half and were sticking for us, it was always going to change. "It wasn't a surprise for us. I thought the charge-down kick gave them that momentum and for the last 30 minutes we struggled to get our hands on the ball." "I did think the game was gone. Our set-piece was poor, our discipline, they won the contact areas and when we turned the ball over they stung us. "It was a long way back - but we got a lot of energy from the bench. "That try Guest scored from the charge-down just gave us a little bit of hope. The more we played, the more we held onto the ball. "We started winning the collisions, we got our offloading game going. "We are delighted to get away with that but we know defensively we are miles better than that." Wasps: Southwell, Varndell, Daly, Masi, Wade, Robinson, Simpson, Payne, Lindsay, Staibano, Launchbury, Wentzel, Haskell, Poff, Vunipola. Replacements: Mayor for Masi (49), Berry for Simpson (60), Palmer for Haskell (63). Not Used: T. Thomas, McIntyre, Taulafo, Johnson, T. Bell. Harlequins: Brown, Williams, Hopper, Turner-Hall, Lowe, Evans, Care, Marler, Gray, Johnston, Kohn, Robson, Fa'asavalu, Robshaw, Easter. Replacements: Dickson for Care (58), Buchanan for Gray (59), Guest for Fa'asavalu (58). Not Used: Lambert, Collier, Matthews, Botica, Chisholm.